Wendy has been in real estate in Emerald since 2005. In 2009 Wendy bought the Elders Franchise and has flourished as the leader of an ever growing business. Wendy is also the major Sales person on staff and loves the excitement of real estate sales, Wendy prides herself on her professionalism and attention to details in getting the very best for her clients, and has successfully settled many homes over the years. Wendy is held in high regard by her peers, and has been rewarded with many awards within the Elders Real Estate group. In her spare time Wendy breeds Jack Russell dogs as well as Dashounds. Wendy is a keen netballer, and when her knees had had enough she volunteered at the Emerald Netball Association, as an umpire and a coach, most evenings during the season Wendy can be found guiding young ones around the courts. 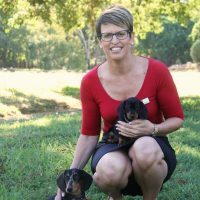 Wendy is a fantastic community member, who gives willingly of her time, and money, you will see the Elders name on many local sporting teams including the Emerald Netball, Emerald Tigers JRL and the CH Rugby League. Would you like to speak to Wendy? If you’re thinking about renting or selling your property and you’d like a clearer picture of how much your property might be worth or want to have an informal chat about general property market trading conditions, Puja will be happy to arrange a full market appraisal of your property.